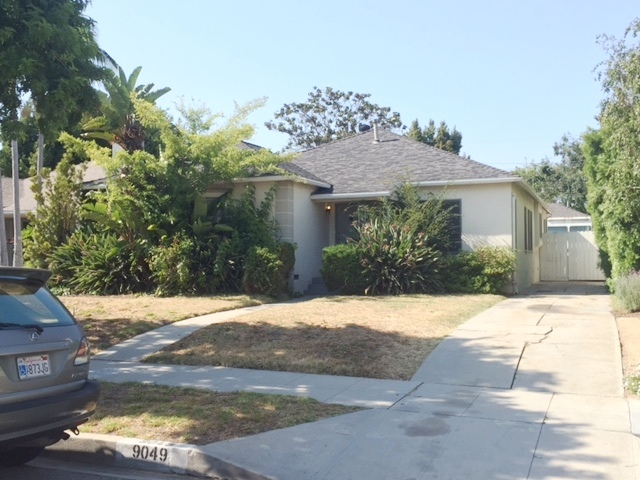 DESCRIPTION: UNBELIEVABLE OPPORTUNITY TO BUY A 2 BEDROOM, 1¾ BATH, TRADITIONAL HOME PLUS A DEN (POSSIBLE 3RD BEDROOM) IN THE HIGHLY SOUGHT AFTER WESTSIDE COMMUNITY OF BEVERLYWOOD. THE HOME FEATURES A LIVING ROOM WITH FIREPLACE, DINING ROOM, KITCHEN WITH DISHWASHER AND LAUNDRY ROOM WITH SIDE BY SIDE WASHER AND DRYER HOOKUP. HARDWOOD FLOORS. LARGE BACKYARD. 2 CAR DETACHED GARAGE WITH ATTACHED BONUS ROOM (BONUS ROOM MAY NOT BE PERMITTED, BUYERS TO VERIFY). PROPERTY LOCATED IN THE BEVERLYWOOD HOMEOWNER’S ASSOCIATION. H.O.A DUES ARE CURRENTLY $660 PER YEAR. BUYER PLEASE CONTACT BEVERLYWOOD H.O.A. @ (310) 276-3463 FOR SCHEDULED H.O.A. DUES INCREASES. HIGHLY DESIRABLE WESTSIDE LOCATION. CLOSE TO SCHOOLS, SHOPPING AND ENTERTAINMENT. PERSONAL PROPERTY NOT INCLUDED IN SALE. H.O.A. PACKAGE AVAILABLE UPON REQUEST. LOT SIZE: 7,643± SQ. FT.
DEPOSIT: $25,000 CASH OR CASHIER’S CHECK REQUIRED TO BID. BALANCE OF 10% DEPOSIT BY PERSONAL CHECK. CASHIER’S CHECK SHOULD BE MADE PAYABLE TO FLANS & WEINER, INC.. IN THE EVENT YOUR BID IS REJECTED, DEPOSIT WILL BE REFUNDED WITHOUT INTEREST.